My CSA share included peas, cilantro, potatoes and eggs. This sent me immediately to the recipes I learned from my Indian cooking teacher, Sunita. I took lessons from her for about 10 years. I love just about any cuisine EXCEPT what my mom cooked. Why? Her people are of Dutch origin, and Dutch cooking is about the most boring meat-and-potatoes cuisine you could ever imagine. I love spices. Savory, pungent, hot, you name it. After college I signed up for cooking classes for Asian, Indian and even Ethiopian cuisine. Sunita’s recipes had the advantage of simplicity. She was a traditional Indian bride. Her husband was working in the US and came to India to find a bride. She met him once, approved of the match, and in the space of just a few days she had to learn to cook basic recipes her new husband would expect served when she moved to the US. As she went back to India on vacations, she learned to use more and varied spices. I could never be a complete locavore, as there are things you just can’t grow in our climate – such a coffee and several spices. I would love to grow a small curry tree, as the true curry leaf is essential in the flavor of several Indian dishes. But they need a tropical climate, so I rely on Indian stores to bring them in from Florida. I had been shopping at Indian stores in Beaverton and Tigard, but was very happy to discover one only a mile from my new house in Vancouver. She had curry leaves and the naan bread I love to have with anda bhurji (eggs and potatoes). I was very happy to start getting eggs from my CSA. 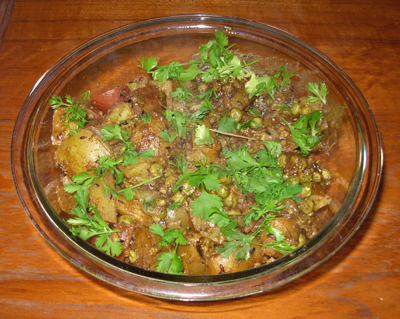 One dish my friends all clamor for when we go for a weekend getaway is anda bhurji – spiced potatoes and eggs. It is essential to have curry leaves for this dish. I discovered in reading that I should be able to freeze the fresh leaves and they will retain some of their flavor. The flavor is released when you add them to the hot oil as you brown the cumin seeds and onions. I figure I may have to use more of the frozen leaves, but otherwise I’d be wasting most of the bag of leaves. They are like bay leaves and will keep for a couple of weeks just in the refrigerator. But my husband only relishes Indian dishes maybe once a month, so I am slower to use them when cooking for two. 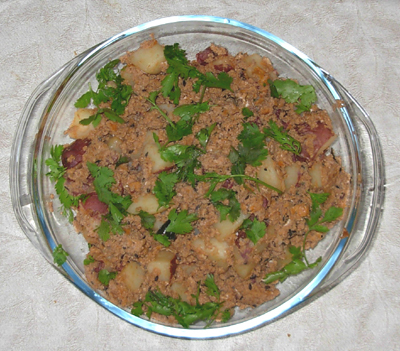 As for me, I could probably eat Indian food solid for…10 years maybe… Anda bhurji is very easy to make and I used the local potatoes, eggs, and cilantro. I leave out the onions when cooking for my husband as he can’t tolerate them. I used canned tomato sauce as my tomatoes are still green on the vine. You may be able to see why my husband only wants these dishes once a month – they look almost identical. And in learning recipes from one teacher, the spices are similar in many ways.